Gaming What Makes Match 3 Games So Popular? What Makes Match 3 Games So Popular? In the ongoing quest for gaming bliss, Match 3 Games has got its nose firmly ahead of the competition. How so you may be asking? For starters, the hallmarks of a leading game developer are: engaging gameplay, immersion, interactivity, variety, quality, and appeal. It’s a pretty tall order to fill, given that places like the Google Play Store are peppered with extraordinary mobile games and attractions. The popularity of Match 3 Games is evident in the types of games they have conjured up. 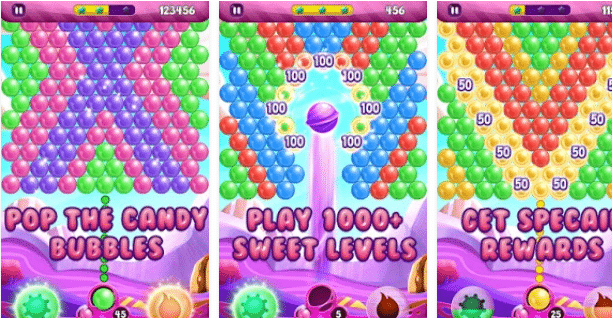 Games like Offline Bubbles, Bubble Fever Pop, Bubblicious, and Grand Bubble Shoot are freely available to fans. These spectacular online games have the WOW factor that players love. They excite the senses, challenge the mind, and engage players in novel ways. Match 3 Games include an auspicious selection of interactive, fun & friendly games. Foremost among them is Bubble Shooter Classic™. Perhaps it’s the throwback appeal of this online game that resonates at the highest level with players, or perhaps it’s the dazzling ensemble of features, colours and interactive elements? In the case of the aforementioned the game, there are 800+ levels of power ups, boosts, and addictive gameplay for players. Players must advance through incrementally difficult levels, as they collect 3 stars for every completed level. This trivia-style game features fireballs and bombs when you pop 7 bubbles in a row, or 10 bubbles + in a row respectively. The appeal of such games is evident in their addicting nature. It’s pretty much impossible to put these games down once you have started playing. Since players have a limited number of moves with which to complete levels, it becomes challenging to clear screens in these games. This gem of a game has a rating of 4.3/5 from 7,200+ players, and many of the adjectives used to describe the game are addicting, fun, challenging, the best ever, etc. Of course, it really helps that the game is free to download and install, and rated E for everyone. So many people get to enjoy the appeal of this bubble shooter game. For players, it is clear that the download and installation are a big part of the deal. The easier it is to download and install the game, the better. 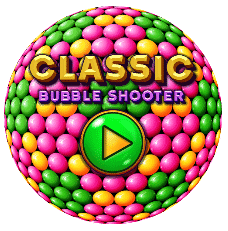 Bubble Shooter Classic™ can be accessed directly from the Google Play Store with your PC, Mac or mobile device. Once it’s up and running, you may have to deal with the occasional advertisement but otherwise it’s straight shooting all the way through the levels. Fancy Some Bubblicious Fun and Games? If you opt for other games like Bubblicious, you’re bound to be impressed – it’s a similar concept. You blast bubbles in a jelly kingdom that is filled with candy and sweets. Remember Bubblicious from the old days? This follows on the same theme, except that you get to enjoy 1,000+ sweet levels, lots of candy bubbles, and delicious rewards. The power ups, levels and bubblegum graphics are out of this world, and that’s why it has a 4.7/5 rating from fans. The more we see of Match 3 Games, the more we like. Offline Bubbles is an arcade-style game – rated E for everyone. It has a 4.6/5 rating from hundreds of players, and there are some 1,000+ levels awaiting you. 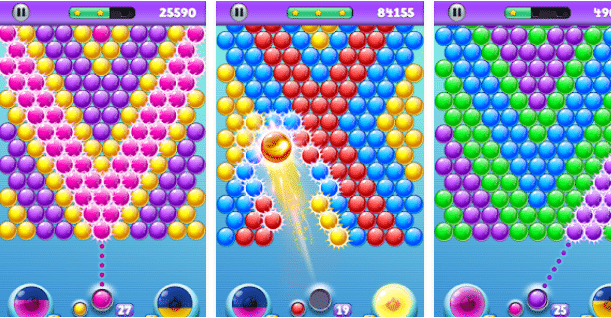 As you pop your way through increasing numbers of bubbles, you win levels and advance to higher stages of the game. This challenging component of the game is what sets this game maker apart from many others. There are no dead-end activities on screen – every bubble that you pop serves a purpose. It’s moving you closer to your goal of a new level. To aim, simply tap the screen and lift your finger to shoot at the bubbles. When you land 7 shots in a row, you get power ups, and when you land 10 shots in a row, your rewards are even better. Here’s where this game gets one up on the competition – no Internet connection is needed – so you can play it even if your phone is out of Wi-Fi range, or has no signal.